We’ve had so little snow over the past few years that I feared it wasn’t going to return. But, alas, the past few days have made up for it. Here’s what I woke up to. The photos were taken through an old window so they’re not as crisp as I’d like. But it’s the only way to get the birds in the photos. When I go out to fill the bird feeders, they all scram. If you want to see how it looks in the summer, there’s some pictures here. Did you notice all the birds in the tree? Most of them are mourning doves. That black ball hanging from a branch is a squirrel eating the peanut butter suet. 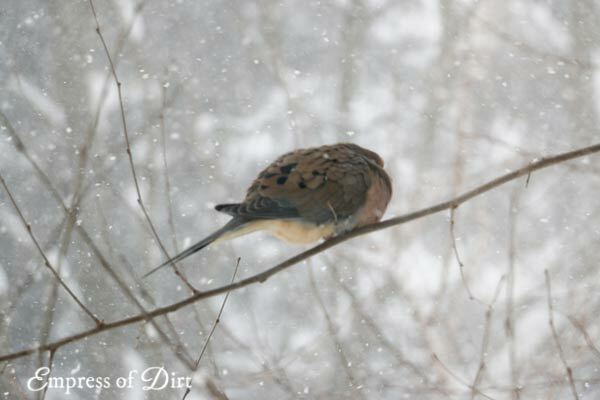 The doves puff up to twice their size to keep warm. If they see me at the window, they keep one eye open. 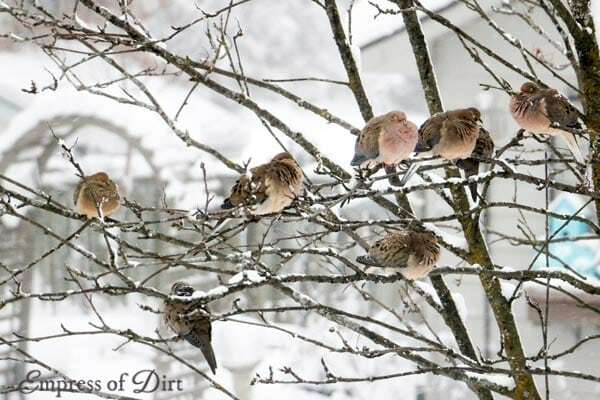 These birds are ground feeders, so I clear a patch of snow and put seed down for them. All the birds (and lots of other critters) drink from the ponds and rely on it, especially during the winter. The water doesn’t freeze because the pumps are running and I have floating heaters/de-icers in them. This guy looks heavier than the branch! 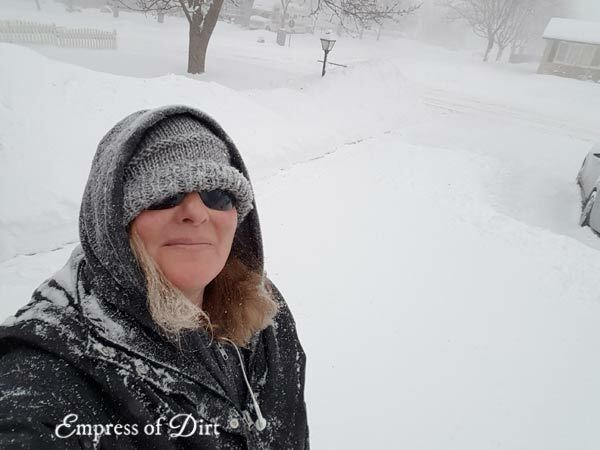 And that’s me after shovelling the snow. Not that you can tell because the wind put half of it back as I was working. I love snow. If I don’t have to drive anywhere and the house is snug and warm, I’m all about it. It’s beautiful and better for the garden. What a winter so far, eh? Between the snow and the cold, as you say, one just wants to sit in the house and look out, rather than be out. “Frugalista” better copyright that word. LOL It is a really good one, and describes a lot of us. DIY is the best way to go on any project in the garden. We are going through bird seed like there is no tomorrow. Maybe it is just too cold for them to forage. Even the wild turkeys come up at times. Thanks for your posts. Always something fun and interesting. I’m seeing a lot of unusual characters at my feeders too—the ones that rarely socialize with the rest of the birds. 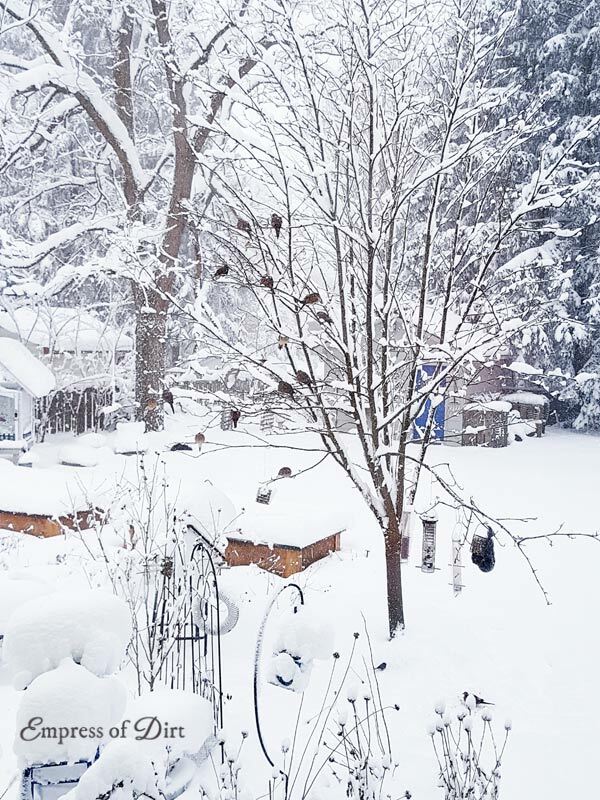 On a scale of 1 to 10, this winter has certainly been visually beautiful! Happy New Year. The snow covering your garden, trees and yard looks so fresh and crisp. You take such good care of your birdees. I do love the birdies, especially this time of year! Hi Melissa! Thank you for this post. 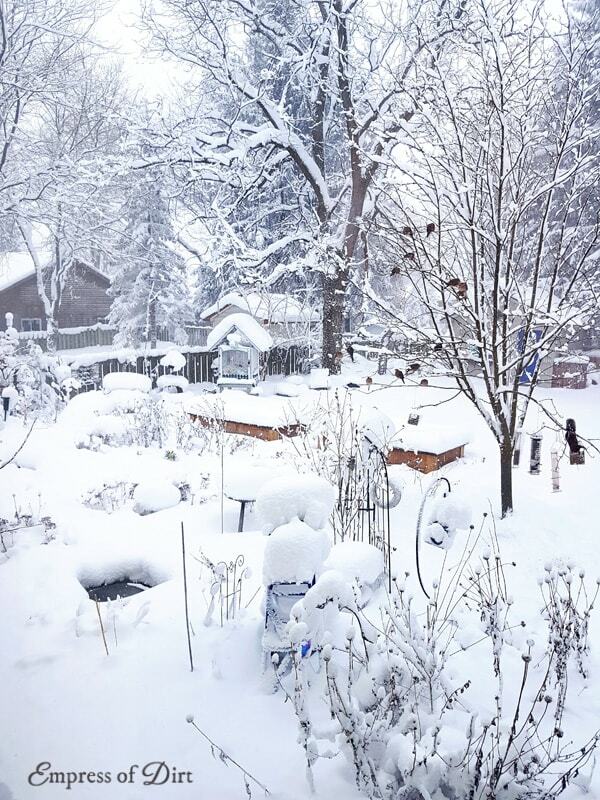 Your garden looks amazing under all that snow! I’m in Ohio but on the West side of Cleveland, so we don’t get as much lake effect from Lake Erie as the Eastsiders do. But we sure have had the cold. 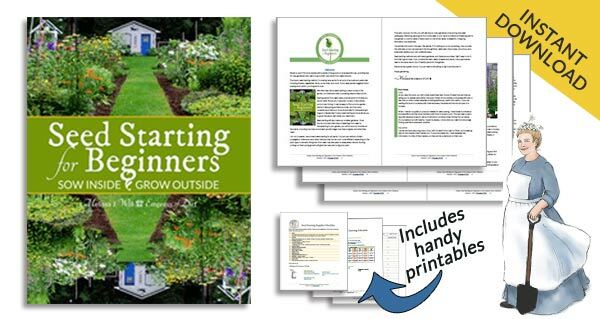 Lately, I’ve been doing some reading and planning for this years’ garden. Anticipation, yes? Really looking forward to it, but it’s very pleasant to remain in the present as well and enjoy all the beauty of the season. Thanks for the lovely pictures. Stay warm and Happy New Year! Hi Larryn, I agree: it’s good to enjoy the moment. It’s not a bad thing to have a rest from the busy summer garden. And it makes spring even sweeter. Happy New Year to you too. How do you make your peanut butter suet?